GEORG supported research projects through open calls during the first phase of the cluster formation, in all 22 projects. These projects then formed a basis for two large projects that combined the results from these projects, namely Deep Roots of Geothermal Systems (DRG) and Waste 2 Value (W2V). The TOUGHREACT project is a numerical simulation program developed at Lawrence Berkeley National Laboratory (LBNL). The project involved the development of a coupled reactive fluid flow model including various reactions of water phase with basalt so as to mimic Icelandic geochemistry within the TOUGH-REACT software and the development of a new method, GOUST, for fitting model parameters using the iTOUGH inverse modelling software. These tools were applied in studies of CO2 sequestration at Hellisheiði, as well as a model of the Laugarnes low temperature geothermal area, including mineral alteration and silica scaling in hydrothermal systems under natural and producing conditions, and natural groundwater quality evaluation. TOUGHREACT is based on TOUGH2, a multiphase fluid and heat flow simulator. TOUGHREACT V3.0-OMP is a major new release of TOUGHREACT that includes many new features and parallelization of the most cpu-intensive calculations in reactive-transport model simulations. Together with TOUGHREACT-Pitzer it provides reactive geochemical transport modelling of concentrated aqueous solutions based on the Pitzer ion-interaction model. The Geothermal Engineering Integrating Mitigation of Induced Seismicity in Reservoir GEISER project worked specifically on developing a better understanding of the key parameters that control induced seismicity in response to an injection. The GEISER research team analysed series of past stimulation experiments from projects such as Soultz-sous-Forêts (France), Basel (Switzerland), Berlín (El Salvador), Gross Schönebeck (Germany) and several Icelandic fields. a comprehensive framework for the assessment of seismic hazard and risk was developed. GEISER also provides guidelines for safe and reliable EGS operation. Key is a dynamic-forewarning-advanced traffic light system that can be used in all phases of a project. A strategy is proposed to enhance public support for EGS projects. Special attention has to be paid to risk perception. Nuisance and trivial damage should be addressed with care and considered as a significant projects risk. 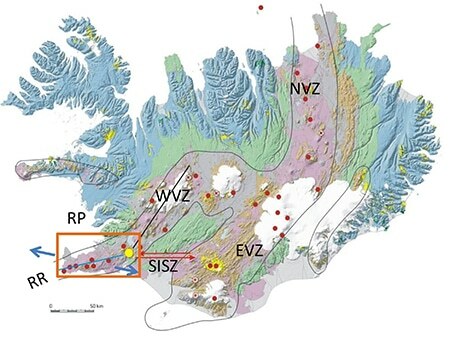 HYDRORIFT is a subproject of the French GEOFLUX which develops cooperation between French and Icelandic groups of scientists to study seismicity and its relation to geothermal activity on the eastern part of the Reykjanes Peninsula in SW Iceland. The Icelandic group consists of specialists from Iceland GeoSurvey (ÍSOR) and HS Orka hf. The French group consists of specialists from the University of Le Mans-Nantes (CNRS) and Ecole et Observatorie des Sciences de la Terre (EOST). HYDRORIFT is a geophysical experiment on the Reykjanes Peninsula in Iceland including both high- resolution TEM/MT studies and seismic tomography. The study follows a successful five-month seismic experiment in the same area (Geoffroy and Dorbath, 2008). The objective is to stress the significance of the velocity anomalies discovered in the area, following the 2005 experiment (notably beneath Kleifarvatn Lake) and to reach a more accurate physical knowledge of the geometry and time evolution of the different fluid reservoirs within the active rift zone in Iceland. This project studied a two-phase flow in geothermal reservoirs, both theoretically using mathematical models and by conducting experiments on such flow situations. The theoretical part involves the development of new and improved relations that account for the complex interaction between phases in porous flow. The traditional relation for such flow is expressed by the Darcy equation, which relates superficial flow velocity to the pressure gradient through fluid permeability and viscosity. However, phase interaction plays a part in the flow and must be taken into account in the two-phase case with effects such as weight difference, friction and surface tension included in the known relation. a vertical direction in response to gravity. The results will be an improved set of relations that describe energy transport in geothermal reservoirs. The equations will be implemented in a simulation tool in order to be able to perform investigations on case studies and comparisons with measurements. Geothermal resources are classified as renewable, but are a combination of an energy current and vast stored energy. This project focussed on the Reykjanes high-temperature geothermal system at the tip of SW Iceland, where a 100 MWe power plant started operation in 2006. The associated production has caused drastic changes in reservoir conditions. This project deals with grouts for cementing steel casings in geothermal wells where high temperature and high pressure prevail (geothermal grout). The current status is such that there is negligible knowledge in Iceland about the properties of geothermal grouts, and such knowledge is also very limited globally. The main objective of the project was to receive overview of various binding materials available for geothermal grouts. Afterwards, correct assessments of the rheological properties of various grouts led to selecting two or three preferred binding materials for further tests. The aim achieved was finding suitable cement for application in a high temperature and pressure environment. The object of the project was to map the resistivity structure of the Grímsvötn geothermal system in detail using (far-) off-central TEM soundings (a variation of the LOTEM method). To locate and estimate the extent of magma bodies in the uppermost 3-5 km of the crust, using the resistivity data along with other existing geophysical data from the area (such as gravity, magnetic and seismic data), and to build a conceptual model of the whole geothermal system. The unique situation in Grímsvötn, i.e. a glacier covered geothermal system, means that the natural thermal output can be estimated quite accurately. The geo-scientific and geothermal value of the project is to compare the size of the geothermal system and thermal output to estimate the thermal output of other systems, based on their structure and volume. The project also has a technical value as this variation of (LO)TEM measurements has not been used in Iceland before. Due to unforeseen incidents caused by the volcanic eruptions in Eyjafjallajökull in 2010 and in Grímsvötn in 2011 the project was stopped and redefined. Deep resistivity surveys have greatly improved the understanding of the inner and deep nature of volcanic high-temperature geothermal systems. In this study the Long Offset Transient Electro-Magnetic (LOTEM) method will be used to map the spatial extent and depth span of resistivity anomalies within the Grímsvötn geothermal system, located in the Vatnajökull Glacier. The objective of the project focuses on a functional and economically viable solution to the problem of hydrogen sulphide exhaust from geothermal power plants. Biological utilization of the geothermal gas (GEOGAS), has until now been the only proposed explanation that could be economically feasible for the Icelandic situation. 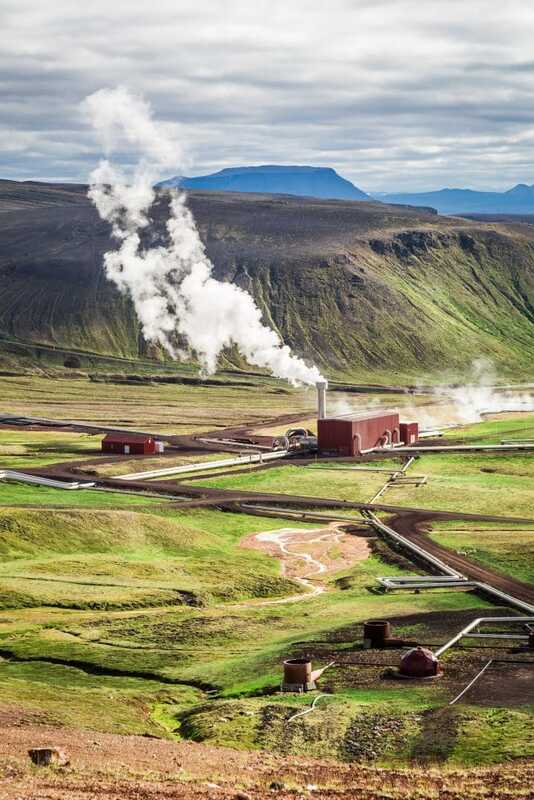 All other proposed or known methods would be too expensive for geothermal power plants in Iceland, due to the much lower electricity price than, for example in California and Europe. A key element in the project has been to do all experiments and development work directly on site, using real geothermal gas produced under industrial conditions from fully operating power plants. This will naturally bring in numerous problems and unexpected incidents that would not happen if similar experiments were to be done under artificial laboratory conditions using controlled, synthetic gas. a technology to improve usage of geothermal reservoirs and to optimize the placement of wells, the steam-gathering system and separators. Secondly, to enlarge know-how in this important field of geothermal exploration in Iceland. Thirdly, to encourage cooperation with a research group in this field at the Berkeley Lab. Lastly, to develop knowledge and a technology that will benefit development of geothermal power production in Iceland. CO2-charged water at the Hellisheiði power plant in SW Iceland, laboratory experiments, computer modelling of fluid flow and gas-water-rock interactions, tracer tests, natural analogue- and cost analysis. CarbFix project members sought funds from GEORG to co-finance three parts of the development: CO2-charged seawater-basalt experiments to find out whether seawater can be used for mineral sequestration of CO2 from geothermal activities, the monitoring and analysis of gases and fluids in the bedrock, and modelling of the injected CO2. The project is a comprehensive Icelandic and USA cooperation under the International Partnership for Geothermal Technology (IPGT) agreement. The focus is set on the development of joint geophysical imaging methodologies for geothermal site characterization and the demonstration of their potential in three areas: Krafla, the Reykjanes- Hengill areas in Iceland, and Coso, California, in the USA. The emphasis is on joint inversion of passive seismic (micro- earthquake) and Electro- Magnetic (EM) gravity and earthquake data. The joint inversion was made in an innovative paradigm of joint geometry rather than a parametric correlation. The project consists of four increasingly ambitious stages, from state of the art to fully joint inversion. 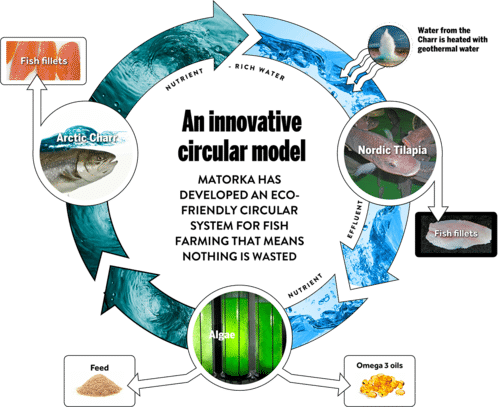 The aim of the project is to implement sustainable warm water aquaculture in Iceland utilizing local resources, building an ecological food park based on integrated systems with polyculture, aquaponics, tailored feed from local raw materials and added value food production with the focus on healthy and safe food for export. Natural green production circles optimize the utilization of energy, water, organic waste material, land and other local resources. This will provide conditions favourable for the sustainable growth of Icelandic food production emphasizing the focus on utilization of geothermal heat, ensuring both adequate supplies of seafood and vegetables and protection of the environment. a focus on specialized subjects, which further broadened the characterization of the geothermal system. The project established a much better view of the diverse character of the geothermal system at Hellisheiði, and gave a guideline to new methodology in the geothermal studies. This project evaluates appropriate cycle and equipment selections for the utilization of supercritical or high superheat geothermal resources. Two preliminary approaches have been presented in the literature: direct admission to the turbine, and a binary cycle. Both of these approaches have serious challenges due to material limitations. The goal of the work was to develop model-driven comparisons and map operating regions to identify the relative merits of different cycle configurations, and quantify the potential improvements in economy or barriers to be overcome above those present for a more conventional plant. 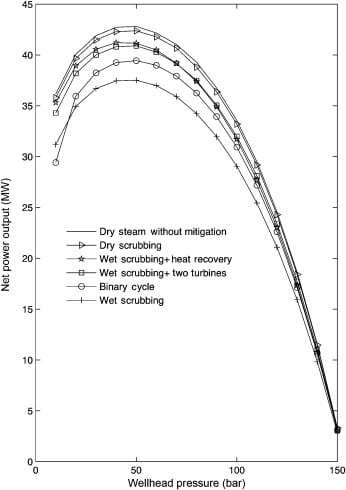 Net power output of each corrosion mitigation method, using the mass flow rate from IDDP. 1994-2009. This includes information on number of consumers, technical issues, total revenue and sales to individual sectors and households. The second stage consisted of assembling national input-output (I-O) accounts which detail the flows of inputs and outputs in production within an economy. A simple 2×2 model, with two sectors – geothermal and other sectors – was constructed and the model was then used to analyse the effects of changes in the factor tax rate (capital and labour), as well as increases in each of the value-added tax rates. More complex 9×9 (with nine sectors) input-output tables were also developed where the energy sector was split, a little arbitrarily perhaps, into a geothermal sector, an electrical energy sector and a hydropower sector. These tables were then used to calculate impact multipliers that describe how changes in demand for one sector affect the rest of the economy. The third and final stage of the project consisted of mapping how Icelandic firms use geothermal energy in their production process. In all, 72 Icelandic firms were found to employ geothermal energy as an input, of which 32 were in horticulture and other greenhouse activities and 24 in aquaculture. A survey was then undertaken to establish how important the geothermal input is for the operation of the firms, and to what extent proximity to geothermal energy sources was a deciding factor in deciding where to locate the firm. The overall goal of the project was to design and build a photo bioreactor-based algae factory utilizing geothermal energy in an efficient manner to fix CO2 into valuable chemicals that are produced from algae. A new photobioreactor (PBR) design was proposed that combines light-emitting diode (LED) technology and algal biotechnology to produce algae from electrical energy and CO2 emitted from geothermal wells in Iceland. Many of the fundamental design parameters of such a factory have already been determined through experimentation with a fully functional prototype operated at the Centre for Systems Biology at the University of Iceland. Sustainable utilization of geothermal energy means that it is produced and used in such a way that it is compatible with the well-being of current and future generations as clearly illustrated by the United Nations Sustainable Development Goals and the Sustainable Energy for All Initiative. Ensuring that energy development fulfils that role is done, for example, through the use of energy indicators for sustainable development that are clearly defined, measurable and scientifically sound, contain benchmarks and can be interpreted in the context of sustainable energy development. The objective of this project was to develop a Sustainability Assessment Protocol for Geothermal Utilization (GSAP), tailored especially for geothermal energy development projects. This protocol and indicators were developed and tested in three countries, Iceland, New Zealand and Kenya. The main achievements of the project were: i) the development of a full set of sustainability goals and indicators to be used for assessing geothermal developments at different stages and in different situations; these can be implemented relying on a similar process as applied to the implementation of Environmental Management Systems; and ii) the development of a method that has been generalized (and already applied in different contexts) for developing sustainability indicators with stakeholder participation. The project investigated chemical changes and rock alteration in vicinity to magma near the roots of active geothermal systems with the aim of improving the understanding of the interaction between the magmatic and hydrothermal system. The project took outset in the active geothermal system in Krafla in N-Iceland. The main objective was to map and characterise changes in chemical composition of fluid inclusions in cuttings from wells that had reached parts of a geothermal reservoir impacted by magmatic gasses. The study found that in vicinity to magma can be found a vapour-rich zone characterised by increased magmatic input in particular CO2. Furthermore, the aim was to attempt to constrain the chemical processes and model the magmatic fluxes at the transition zone between the magmatic and hydrothermal system. The goal of the study is to develop and test a methodology that can be used to conduct an economic valuation of the environmental costs of geothermal utilization. First this project will review the different environmental impacts of geothermal utilization and reveal why economic evaluation of environmental impacts is important. Second, the theoretical framework is constructed for assessing the environmental costs associated with utilization of geothermal power and different evaluation methods are reviewed illustrating the best applicable methods in the case of geothermal utilization. Finally the project will provide a pilot economic evaluation study on the environmental impact of geothermal utilization at two locations in Iceland. This research will create domestic expertise on how to assess the economic value of geothermal utilization and will further Iceland’s status as a leader in securing sustainable energy development, sustainable geothermal utilization. H2S is commonly emitted into the atmosphere from geothermal power plants, causing potential environmental problems. A possible H2S disposal method is injection back into the geothermal system where H2S may mineralize forming sulphides. The project “H2S sequestration into geothermal systems” aims at defining the geochemistry of geothermal H2S sequestration and its geochemical feasibility. 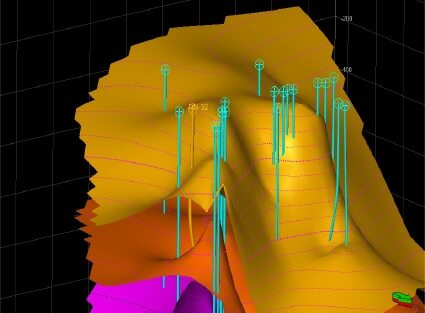 Emphasis was placed on studying the rate of H2S mineralization, possible oxidation to sulphuric acid and together with geochemical modelling, assessing the optimal conditions of H2S disposal. The project was a joint effort between scientists that have contributed to this subject in earlier years. Description: (A) The simulated phase relations and temperature distribution of a ~2000–4000 year old geothermal system initially with a magmatic heat source with the top at 2 km depth, of basalt composition and having temperatures of 1100°C. (B) The measured phase relations in the Krafla geothermal system expressed as Enthalpy (h) – Pressure (P) diagram for water with temperature contours. Preventive Maintenance (PM), Condition-Based Maintenance (CBM) and Corrective Maintenance (CM) methods are commonly applied in geothermal power plants (GPP) and each has its strengths and weaknesses when applied to different maintenance scenarios. In order to achieve an optimum and cost effective maintenance strategy the proper program for the scenario must be selected from the different maintenance methods. In this project the maintenance required and carried out for steam and fluid equipment in GPPs – from borehole to injection well – were documented and analysed. Real performance data was used to study currently used maintenance methods and to investigate approaches for more efficient maintenance management.